This article is about a famous former indian cricketer, who is responsible for the victory of Indian Team in Test series in England by 2-0 in year 1986. This man is none other than indian pace bowler of 1980's Chetan Sharma. A detail about his cricket career, profile and record is given here. 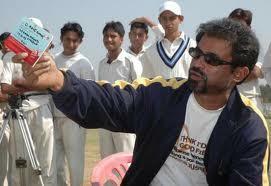 Chetan Sharma is a former Indian medium pace bowler who has played for Indian National cricket team in 1980's. He was the bowling patener of Kapil Dev in that period. Chetan Sharma started his cricket career playing for Haryana. At a very young age, he debuted in an ODI match against West Indies in 1983. He took three wickets in the match. A year later he played his first Test match against Pakistan at Lahore. Soon after he established himself as a bowling partener of Kapil Dev. It was an extraordinary performance by Chetan, which led to a 2-0 victory over England in Test series in England on Tour of 1986. He took 16 wickets in two match series. His match figure of 10/188 in first Test was the first 10 wicket haul in a match in England by an Indian bowler. But he lost his place in Test Team after some period and only represented in ODI Matches. Chetan Sharma is also a very good tailender batsman. This he proves by playing an unbeaten innings of 101 runs against England in an ODI match. He has also scored three hundreds in First Class Cricket.